A developer is spending $14 million to expand a building occupied by a Huntersville food-packaging plant, which will grow into the facility. Prairie Brookwood will more than double the size of the Pactiv Corp. packaging facility with an addition of 324,500 square feet. The idea is to create a warehouse there. 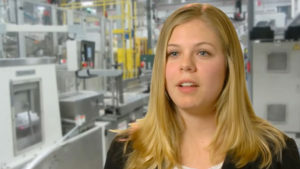 A Pactiv employee speaks in a company video. There’s no word about yet about how many jobs Pactiv, which at last count employed 300 at the Huntersville plant, will add in the expansion, says Ryan McDaniels, executive director of the Lake Norman Regional Economic Development Corp.
John McGrath, Pactiv president and CEO, says the addition is to serve a growing demand from customers for the company’s foam, plastic, aluminum, paperboard, coated board and molded fiber packaging for the food-service industry. “The expanded facility will complement our already strong and growing North American manufacturing footprint and enable the company to remain focused on our current product lines as we continue to meet the demands of our customers,” McGrath says. Benjamin Shapiro, manager of Prairie Brookwood, says the company joined Cornelius, Davidson and Huntersville in a partnership to build the structure, which was the first building in Commerce Station Park. “This expansion fulfills our shared vision for creating a state-of-the-art manufacturing and distribution facility upon 40 acres of raw land, and serves as an excellent model for government and private industry working together to create good jobs for a community,” Shapiro says. Graycor Construction Co. is the contractor on the project and the project is being managed by the company’s Southeast regional office in Charlotte. blog loads extremely quick for me on Internet explorer. Exceptional Blog! hello!,I like your writing so a lot! percentage we keep in touch extra about your article on AOL? I was recommended this blog by way of my cousin. I am not sure whether or not this submit is written by way of him as nobody else understand such distinctive about my trouble. After going over a handful of the blog posts on your web site, I really appreciate your way of blogging. It’s amazing to pay a quick visit this web site and reading the views of all colleagues regarding this article, while I am also zealous of getting know-how. Thank you a lot and I’m taking a look ahead to touch you. Will you kindly drop me a e-mail? issues and I in finding it very troublesome to inform the reality then again I will certainly come again again. mindful your stuff prior to and you’re just extremely wonderful. Unquestionably believe that that you stated. Your favourite reason seemed to be on the internet the easiest thing to keep in mind of. I wonder how so much attempt you put to create such a wonderful informative web site. I would by no means understand. It sort of feels too complicated and extremely broad for me. I’m having a look ahead on your subsequent submit, I’ll try to get the grasp of it! few attention-grabbing issues or tips. Maybe you could write subsequent articles regarding this article. Useful info. Fortunate me I discovered your site accidentally, and I am surprised why this coincidence did not took place in advance! article is in fact fruitful for me, keep up posting these content. $14M expansion in Huntersville | bdomag <Liked it! Moreover, The contents are masterpiece. you have done a great job in this matter! These are genuinely wonderful ideas in about blogging. You have touched some good factors here. It’s remarkable in support of me to have a website, which is good for my know-how. to find so many helpful information here in the publish, we want work out more strategies on this regard, thanks for sharing. your augment or even I success you get right of entry to consistently quickly. The clarity in your post is just excellent and that i could suppose you’re a professional in this subject. impending post. Thanks a million and please continue the gratifying work. thing. Do you have any points for newbie blog writers? I’d genuinely appreciate it. in future. A lot of other folks can be benefited out of your writing. be shared around the net. Shame on Google for now not positioning this submit upper! A number of them are rife with spelling problems and I to find it very troublesome to inform the truth then again I’ll certainly come back again. carries awesome and really excellent stuff for visitors. I’ll immediately seize your rss feed as I can not find your e-mail subscription link or newsletter service. I pay a visit everyday a few web sites and sites to read articles or reviews, but this weblog offers quality based writing. this website is really nice and the viewers are genuinely sharing nice thoughts. this website, this webpage is in fact remarkable. the internet people, its really really nice piece of writing on building up new blog. I’m bookmarking and will be tweeting this to my followers! Outstanding blog and superb style and design. extremely vast for me. I’m taking a look ahead in your subsequent publish, I will try to get the cling of it! you’re speaking about! Bookmarked. Kindly also visit my site =). I do think that you ought to write more about this issue, it might not be a taboo subject but generally folks don’t discuss such subjects. hard in support of his web page, since here every material is quality based material. back from now on. I want to encourage yourself to continue your great writing, have a nice day! I surprise how much effort you put to make this kind of magnificent informative website. I’m gone to inform my little brother, that he should also pay a visit this web site on regular basis to obtain updated from most up-to-date reports. what you’ve written. Just my opinion, it might make your website a little bit more interesting. I am genuinely delighted to glance at this blog posts which carries lots of helpful data, thanks for providing these information. in the foreseeable future. I want to encourage continue your great writing, have a nice day! reviews that also clear their motive, and that is also happening with this post which I am reading at this time. Can I just say what a relief to find a person that truly knows what they’re discussing on the internet. a little vanilla. You ought to glance at Yahoo’s front page and note how they create article headlines to get viewers to open the links. good. I do not realize who you are however certainly you are going to a famous blogger if you happen to aren’t already. blog and will come back someday. I want to encourage one to continue your great posts, have a nice day! Hello to every body, it’s my first go to see of this weblog; this webpage includes awesome and really fine information in favor of visitors. starting this up. This web site is something that’s needed on the internet, someone with some originality! site owners and bloggers made just right content material as you did, the internet can be much more useful than ever before. writers to write content in your case? I wouldn’t mind producing a post or elaborating on some of the subjects you write regarding here. I am genuinely happy to read this web site posts which includes tons of useful data, thanks for providing these kinds of data. not sure whether or not this post is written by way of him as nobody else know such specified approximately my problem. Yes! Finally someone writes about soccer jerseys. been hoping to start my own blog in the near future. Anyways, if you have any suggestions or tips for new blog owners please share. done a formidable task and our whole community can be grateful to you. Hi there, I discovered your web site via Google even as searching for a related subject, your site came up, it appears to be like great. A lot of other folks might be benefited from your writing. Cheers! this weblog includes remarkable and genuinely excellent information in favor of readers. video clips to give your posts more, “pop”! Your content is excellent but with pics and video clips, this blog could undeniably be one of the greatest in its niche. Fine way of describing, and fastidious paragraph to obtain data regarding my presentation subject, which i am going to deliver in institution of higher education. may anybody get that kind of info in such a perfect method of writing? Fastidious answers in return of this matter with real arguments and describing everything regarding that. consists of lots of useful information, thanks for providing these statistics. Magnificent items from you, man. I have take into account your stuff prior to and you’re simply too magnificent. I really like what you’ve acquired right here, certainly like what you’re saying and the best way through which you say it. website consists of remarkable and truly excellent data designed for visitors. I don’t even know how I stopped up right here, but I believed this publish was great. Thanks for your personal marvelous posting! I certainly enjoyed reading it, you can be a great author.I will make certain to bookmark your blog and will often come back later on. I want to encourage continue your great job, have a nice afternoon! Reading this information So i am happy to exhibit that I have an incredibly just right uncanny feeling I found out exactly what I needed. him as nobody else know such detailed about my problem. You are incredible! It’s genuinely very complex in this full of activity life to listen news on Television, thus I just use world wide web for that purpose, and take the latest information. they are discussing online. You definitely understand how to bring an issue to light and make it important. your website got here up, it seems to be great. I’ve bookmarked it in my google bookmarks. The overall look of your site is wonderful, as smartly as the content! Thanks for some other great post. Where else may just anybody get that type of info in such an ideal way of writing? get irked even as other people consider issues that they plainly do not know about. anything completely, however this paragraph provides nice understanding even. Hi to all, the contents present at this web site are in fact awesome for people knowledge, well, keep up the nice work fellows. information you present. It’s nice to come across a blog every once in a while that isn’t the same unwanted rehashed material.